Welcome to the home of australian lapidary supplies. Within this site you will find our complete catalogue on jewellery mountings, findings, neckchains etc. 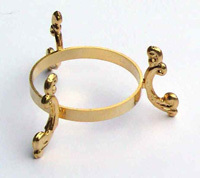 as well as a large range of 24kt Gold Plated egg stands and stampings for the art of Egg Decorating. Most items are manufactured on site to provide you with the best quality at a reasonable price, as we have done for over thirty years.